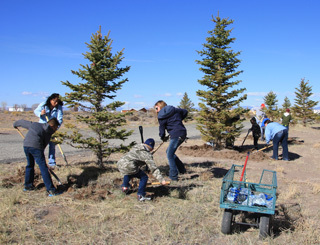 For years wind-blown sand has formed dunes against the more than 50 Blue Spruce trees lining the road into the Alamosa Cemetery. Dunes obstruct life-giving water and air from reaching the tree roots. A couple of days before Earth Day, the dunes disappeared. Thanks to Cub Scout Pack 307, Boy Scout Troup 307 and supporters, the trees have freshly dug water basins filled with mulch. According to Scout Leader Logan Hansen, 44 volunteers turned out. 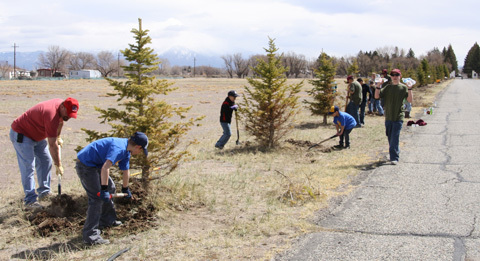 The group worked cheerfully and tirelessly to improve our community – many worked for four hours. The basins will help retain water and the mulch will lessen evaporation and mitigate drastic changes in soil temperature. With the wide fluctuations in daily temperatures here in the San Luis Valley, unprotected roots near the surface can be frozen in the morning and too warm in the afternoon. The stress doesn’t help a tree remain healthy. The volunteers dug the water basins. Jeremy Arellano and Dennis DeHerrera of the Department of Parks and Recreation distributed mulch which was spread to a depth of four inches in the basins. Some of the digging was very difficult due to grass roots and compacted soil. 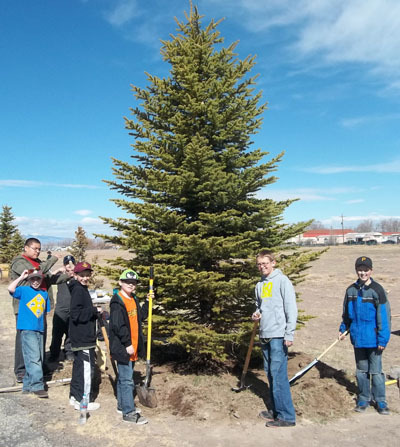 Volunteers - Cub Scouts included Dakota Hansen, Mason Gonzales, Jordan Malouff, Toby Abbey, Blair Marrs, Santiago Trujillo, Isaiah Avila, Tyler Christensen, Jaden Provence and Wyatt Kloberdanz. [Left to right] Michael Martinez, Tyler Christensen, Thomas Frye, Gabriel Hansen, Dakota Hansen, Tim Loosbrock, and Landon Kreps take a quick break for a photo op. Groups picked trees to tackle after a brief training session. Key tips included avoiding nicking the tree trunk and to watch out for drip irrigation tubes. Drinking water was handed out and bottles recycled. Boy Scouts included Gabriel Hansen, Landon Kreps, Lucas Archuleta, Abel Malouff, Robbie Jones, Caleb Babcock, Tim Loosbrock, Cameron Christensen and Leighton Burt. Venturers were Alexis Hansen, Baily Babcock and Caitlin Babcock. Other youth included Thomas Frye, Andres Atencio, Austyn Marrs, Michael Martinez, Talon Finehout, Mason Finehout, Gilbert Cardenas and Cody Buxman . Scout Leaders were Logan Hansen, Roy Ratzlaff Jr., Dawn Melgares, Jessica Hupe, and Tina Babcock. Adult volunteers included Nicholas Gonzales, Veronica Trujillo, Erik Christensen, Sophia Avila, Anna Martinez, Dana Provence, Cherise Minnick, Louise Malouff, and Rich Loosbrock. Tree Board members and associates included Karyl Scarlett, Tom Scarlett, Audrey Liu (home-made cinnamon roll provider), and Marilyn Loser. Scouts and supporters dug in for up to four hours. 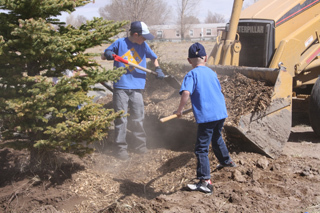 Tyler Christensen and Blair Marrs add mulch to a water basin.